A detective’s search for a missing friend “careens ahead with the speed and promise of danger of the Indy 500” (The Washington Post Book World). With a genius IQ, a past career as a circus acrobat, and a black belt in karate, criminology professor Dr. Robert Frederickson—better known as “Mongo the Magnificent”—has a decidedly unusual background for a private investigator. He also just so happens to be a dwarf. Mongo’s friend and sensei, Veil Kendry, is pretty magnificent himself. A devoted martial arts instructor and extremely successful abstract artist, Veil single-handedly transformed his shady neighborhood in New York City’s Lower East Side into a safe haven from crime and corruption. But when Mongo enters Veil’s abandoned apartment and finds a bullet hole, a cryptic oil painting, and an envelope addressed to him containing $10,000, he starts to worry that Veil’s reputation as a vigilante has gotten him into the worst sort of trouble. Determined to find his friend, Mongo attempts to rule out any enemies from Veil’s past—details of which Veil has never shared with him. But as he uncovers the shocking truth of Veil’s time in the Vietnam War—participating in dangerous CIA missions under the call sign “Archangel”—Mongo soon finds enemies aplenty, ones that will do anything to make sure the past remains a secret . . . In addition to creating “the most engaging detective in decades,” author George C. Chesbro introduces the character of Veil Kendry, who would go on to have his own series (Library Journal). 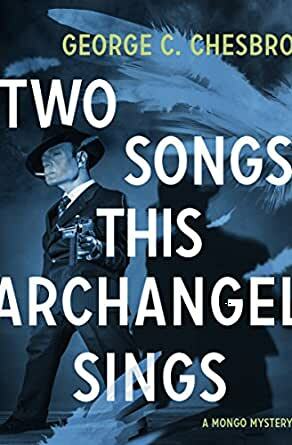 Two Songs This Archangel Sings is the 5th book in the Mongo Mysteries, but you may enjoy reading the series in any order. Another great Mongo book. Though "Beasts of Valhalla" & "The Fear in Yesterday's Rings" are my two favorite Mongo books, this is in the top tier. Mongo's friend Veil gets him & Garth in all sorts of trouble, including having high elements in the government after them. Mongo doesn't get to display much of his extraordinary physical skills in this one, but he & Garth are pushed to their limits trying to evade killers on all sides while they try to unravel the mystery Veil set out for Mongo. Garth, as is often the case, is not thrilled with Mongo racing out into danger to try & save some friend's bacon. Garth also has an extra problem that becomes clear only at the end of the book; this is nearly the first half of a two-book series. To discover in full what happens to Garth as a result of what happens in this book, you need to read "The Cold Smell of Sacred Stone." But like nearly all the Mongo books, it's a pleasure to do so...I'm even reteaching myself French to read the only Mongo mystery I haven't read dozens of times, one that was only published in French; "Le Seigneur des Glaces et de la Solitude" (The Lord of Ice & Loneliness). Grateful this was available and in such a nice copy. 4.0 out of 5 starsAnother fun Mongo book! I'm a fan of all of Chesbro's writing - and love Mongo the Magnificent as a protagonist. 4.0 out of 5 starsVery good book. Very good book. Sorry George C. Chesbro passed on. 5.0 out of 5 starsThis One Has It All! Wow! Action, suspense, martial arts, betrayal, intrigue and explosions...what more could an adventure fan ask for? Although this is the 5th Mongo mystery written by Chesbro, it was the first one I read. Since then, I have managed to track down and read 11 others. What sets these books apart from the competition are the characters and Two Songs This Archangel Sings is no exception. This book introduces Mongo fans to Veil Kendry, black belt, artist and mystery man extraordinaire. As we begin the story, Veil is missing and his dwarf, former-circus-star-turned-private-investigator, black belt, martial arts student, Mongo, must sift through the lies, disinformation, clues and cover-ups that make up Veil's shadowy background in order to find him before it's too late. Along the way he encounters more than a few people who have no intention of seeing him complete his task including covert operatives, a ninja and...well, you'll just have to read the book. This is one of my all-t! ime favorite books and I highly recommend it to anyone who likes adventure, mystery and action.